Computer or Eurorack, you still want to get those grubby hands on your sounds. So the latest update to the free and open modular platform Rack makes that cheap and easy, with gamepad support. Developer Andrew Belt is clearly a busy man. His latest update maps from gamepads to virtual voltage inside the software modular environment. Watch via this — uh gentle ambient demo? Just added gamepad and computer keyboard support to VCV Rack, soon to be released in Rack 0.6.1. Joysticks are mapped to voltages -10 to 10V for each axis using the MIDI-CC module from Core with the new “Gamepad” MIDI driver. Buttons can be converted to 10V gates using MIDI-Trig. Similarly to actual MIDI controllers, click the CC or note name display to learn/assign a gamepad joystick/button. The “Computer Keyboard” driver supports the QWERTY US layout and spans two octaves with octave up/down buttons. This update also adds the ability to use the same MIDI device on Windows with multiple virtual MIDI modules. Previously this was caused by the Windows MIDI API requiring exclusive access to each MIDI device, so having multiple instances would crash. I have written a MIDI “multiplexer” that solves this. Good stuff. I can also imagine an ultra-portable sound rig with a compact PC and a gamepad and keyboard attached – running Linux, of course. 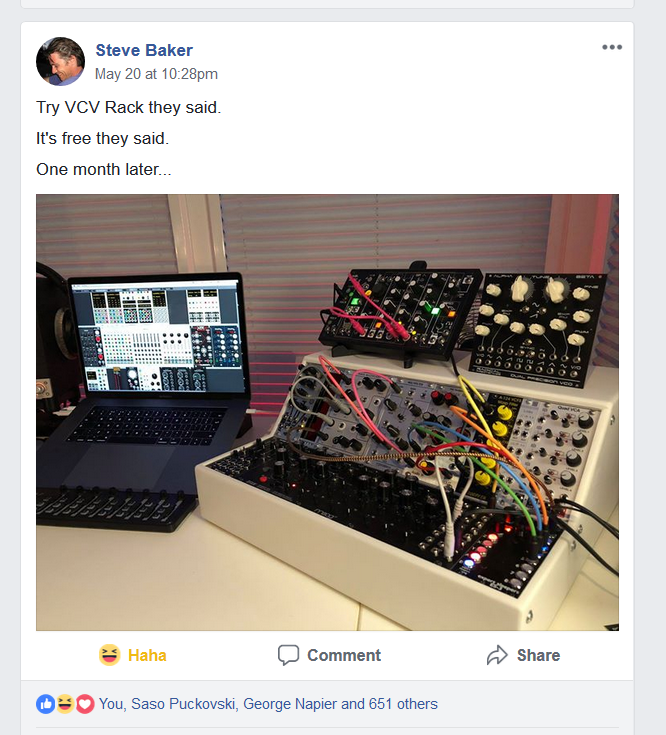 Oh yeah, and while VCV Rack is free (with inexpensive software add-ons for high-quality modules), there is this problem – it could make you buy hardware.